Do you own a car? Do you drive your car regularly? Do you think you are completely protected through your comprehensive car insurance policy? Some latest dreadful stats will force you to think again. When it comes to safety on road in all countries around the world, India's position is getting worse with each passing year. According to latest Government data, one person dies on Indian roads in every 3.5 minutes, 17 people in every single hour and a staggering 400 people in a day. 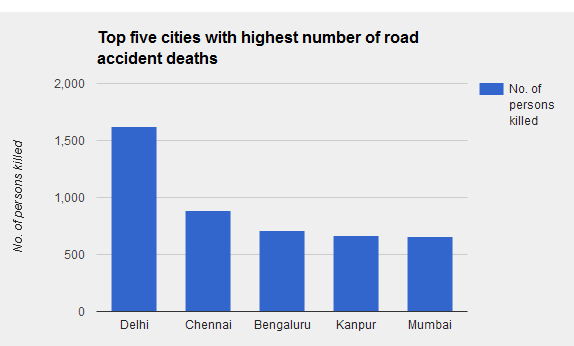 The data further reveals the dismal picture of India's road safety as 5,01,423 accidents took place in 2015 and 146,133 people died in road accident in the same year. The latest data of International Road Federation reveals the alarming fact that only Russia reported more accidents in 2015 than India. While the importance of Government's initiative to promote safe driving and road safety cannot be stressed more, individual car-owners should also consider availing additional protection. Gone are the days, when your options were limited between a third-party and comprehensive car insurance policy. Today, you can opt for an array of add on covers by paying extra premium to enhance the existing coverage provided by your regular motor insurance cover. In simple words, you will stay covered against various damages and unforeseen events that a regular auto insurance plan doesn't cover. All add-on covers can save you a lot of money. In case you are not armed with these add-on covers you have to shell out a huge amount from your own pocket at the time of claims. 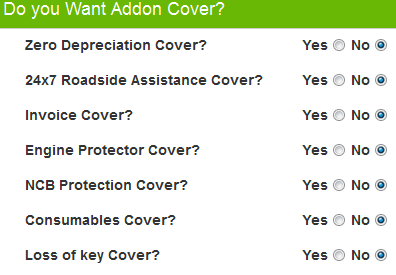 Let's gather some crucial information various types of add on covers. If the windscreen glass (either front or rear or both) of your car gets broken accidentally and require replacement and repair this car insurance add on cover will protect your No Claim Bonus. Usually, car insurance policyholders lose whatever No Claim Bonus they accumulated on making a claim for windscreen glass repair/replacement. With this add on cover, you can keep No Claim Bonus in tact even after making windscreen glass repair/replacement claim. In case some of the important electrical parts of your vehicle breaks down even if the vehicle doesn't meet any accident this add on cover will bear the expense of repair of these specific parts. However, this car insurance add on cover comes with some terms and conditions. Your vehicle should not be more than 3 years old and you have to ensure that you have not not breached guidelines prescribed by the manufacturer. And, the cover does not include the broken electrical part. Although, the cost of engine damage repair is quite high but it won't hurt your pocket if you avail this add on cover. Engine Protect Cover compensates for engine repairs expenses regardless of any accidents. This car insurance add on cover is useful for those who newly have bought high-end cars and it is available for vehicles that are not more than 3 years old. A comprehensive motor insurance plan does not cover various consumable parts such as nuts and bolts, engine oil, screenwashers, bearings. But, if you want to make claims for these parts if your vehicle gets involved in any road mishap you can opt for this add on cover. Your car insurer will pay you for the replacement of these consumables. But again, you are only entitled to avail this add on cover if your vehicle is not older than three years. All motor insurance policyholders are eligible for No Claim Bonus if they don't make any own Damage claim in an entire policy year. There are certain slabs of NCB that you reach with each passing year and over the period of 5 years the total NCB that you can accumulate is 50% NCB. However, your one single claim will bring the total NCB to nil. The NCB Protector add on cover keeps your earned NCB protected. By armed with this add-on-cover, you can make claims for partial loss such as windshield glass repair or replacement, accessories or total vehicle theft and also for the total loss of the vehicle. The NCB Protection Cover will take care of your first 2 claims. Do add on covers work in the event of Total Loss? Most car accidents cause damage to various parts of vehicles that require repair or replacement. This is considered as partial loss and there are add on covers to look after this type of loss. But if any accident cause total loss to your vehicle? Will your insurer replace your can if it is damaged beyond repair or only pay the money? And, how can you establish total loss? A damaged vehicle is considered a total loss when the repair cost is more than 75 per cent of the IDV of the vehicle. In this type of situation, if you are a comprehensive auto insurance policyholder, your car insurer will pay out the total IDV after deducting the compulsory excess which is Rs 1,000 for vehicles with engine capacity below 1,500 cc and Rs 2,000 for vehicles with engine capacity over 1,500 cc to the policyholders. The IDV is determined by deducting the depreciation from the ex-showroom price of vehicle of particular make and model when the car insurance policy was first availed. The tariff of depreciation differs with each passing year. Here is the tariff slab of depreciation. You don't have to remain content with only the IDV if you get this car insurance add on cover. With this cover, you are entitled to get the original invoice value, including road tax and registration fees in case of total loss or theft of your car. In simple terms, return to invoice cover pays out the difference between the claim amount approved by your insurer and the original price of the purchase in case of total loss. This add on cover is useful for those drivers who commute in theft prone areas and on the highways. Like many other add on covers, this cover also has some limitations. You can avail this cover for Vehicles up to three years old and this add on cover is not applicable to imported vehicles. How can you establish total loss? Your return to invoice cover will come good once you establish that you insured car is at total loss. Hence it is vital to know the right procedure to make this add on cover work to good effect. You need to furnish some essential documents like registration copy, FIR and driving license and provide an estimated amount for repair from the garage. Your car insurance company will appoint a surveyor to verify the documents, assess the loss to finally declare if the vehicle is a total loss or can be repaired. If the liability of your car insurer after deducting the depreciation is over 75 per cent of total sum insured your vehicle could be termed as total loss. What happens to policy when insurer pays the claim amount after declaring total loss? Your motor insurance policy will be off and you cannot renew the policy once your car is considered as total loss and you get the claims paid. You need to surrender the RC of your vehicle in regional transport office to cancel its registration. You need to ensure the transfer of documents is conveyed to the RTO even if you want to sell the wreck to a scrap dealer. Now that you have realized that these add on covers are of utmost importance to strengthen your existing car insurance cover you should look to avail them without any delay. At GIBL.IN you can compare the premium of comprehensive car insurance policy and price of add on cover simultaneously. While putting in basic information about your car to compare available motor insurance quotes you can also select an add on cover that you need and see how much it costs. Among the multiple quotes you will receive, you can select any one provider of your choice. Most of the car insurance companies in India provide these covers and the price varies from one car insurer to another. Suppose you want zero depreciation cover for your vehicle. In that case, you should compare the price offered by different insurers for this particular add on cover and then make an informed purchase. To make a detailed yet fast and easy comparison you can resort to GIBL.IN, the premiere online insurance marketplace in India. The above list is of top 5 lowest car insurance policy premium for a 5 seater Honda City car registered in Kolkata (model variant 1.3DX Petrol, cubic capacity 1343 cc) after choosing to opt for zero depreciation cover alongside the base car insurance cover. The price of zero depreciation cover is in the range of Rs. 1640 and Rs. 2623. The price of the car insurance add-on-cover depends on the IDV of your car and its engine capacity. Here is a list of all major car insurance add on covers along with their prices for cars of various segments. You might have to shell out some more for your car insurance policy might require from your pocket if you want to include some crucial add-on covers. But if you choose not have any of those add on cover; an unforeseen event such as engine failure or car theft would burn a huge hole in your pocket. So, it is always prudent to spend another Rs. 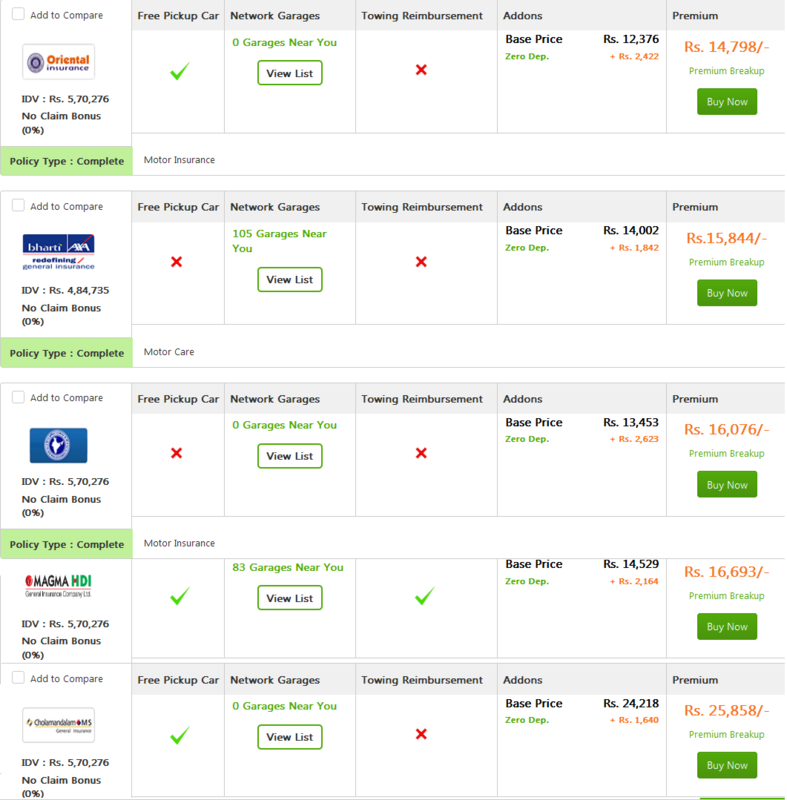 2000 – Rs.3000 for car insurance add on covers. If you choose to spend this additional amount it will provide you with total financial safety in case of any damage caused to your car. The best way of availing car insurance add on covers is by comparing various insurers online. Since, GIBL.IN allows for most hassle-free comparison; you should turn to this premiere online insurance portal and start comparing for your favorite add-on covers now.